Opened in 1921 with seating for 893. 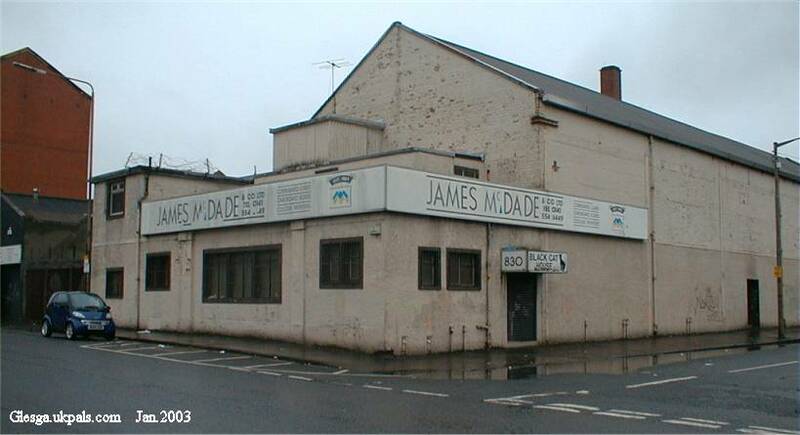 Closed in 1955 was subsequently used as TV studios for BBC Scotland, then warehousing from 1974.
was hilarious, its well seen we never had much in those days we were easy pleased eh but great days. I saw a horror film called "The Black Cat" in the mid 40's and it frightened the bejaisus out of me. For a year ot two after that, everytime I passed the The Black Cat cinema, in a number 30 tram, I got the shivers. When I was a wee boy in the 1950s there was a travelling show that the BBC ran, I think it was called "Caravan" or something similar. It was scheduled to have a show in Tollcross park, but on the day, the heavens opened and it was a total washout. But not to be outdone, the BBC decanted the outdoor show to the Black Cat. They were of course missing an audience, so they came over to my primary school, which was Newlands Primary in Springfield Rd at Parkhead, and "borrowed" all of the pupils as an audience. You can imagine my mother's surprise when sitting at home, she turned on the T.V. to see my brother and me and all our friends sitting in the front row of the show cheering our heads off.